Donna Hay is where food styling starts and ends. She is a trailblazer and a tastemaker. This is a compilation of her seasonal location work from her eponymous magazine and it is without doubt one of the most beautiful cookbooks on the market. Fellow Dubliner Katie Quinn Davies was one of the first food bloggers to raise the standards of food photography online. The rest of the blogosphere soon followed suit by upping the ante. But this book isn’t a case of style over substance: the recipes are as inspiring as the images. Domini’s books are always fantastic. This one is a beautifully presented compilation of her work, with a focus on evening meals. Always inspirational and always reliable. You’ll never ask ‘what’s for dinner?’ again. Catherine’s latest book is a homage to Italian baking and is filled with all manner of sweet treats. Home baking enthusiasts will appreciate the niche theme while Italophiles will enjoy the insight into Italian baking and culture. The Scandinavian couple present a refreshing collection of vegetarian recipes in a book that has sold across the globe. This might be earthy, healthy fare, but it’s also delicious and easy to make. I’m looking forward to reading their next book, Green Kitchen Travels. Simon is the food writer’s food writer. He is a meticulous cook and it comes across in his copy. I can read his books from cover to cover. Disclaimer: I did the photography for this book. But that’s not why it’s on my shelf. Sharon is full of ideas and she really struck gold with this particular one: oven-free desserts. Ideal for those who have had more baking misses than hits. This is something of a coffee table book by a mother and daughter duo who are highly successful in Sweden. 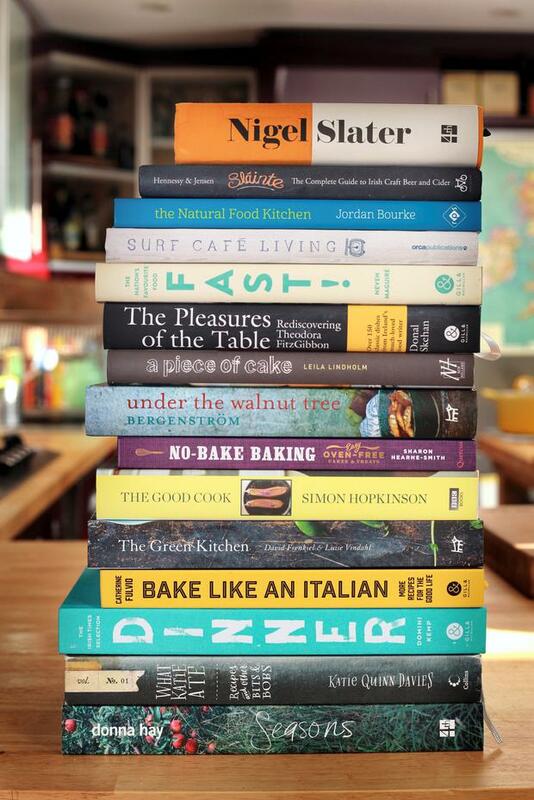 The recipes are organised by ingredient and inspired by their travels. A modern classic. Leila Lindholm is the Nigella Lawson of Sweden. She has always remained ahead of the curve and her books have sold in the millions. If you’re buying this book, make sure to experiment with the cinnamon and cardamom buns. This is a compilation of the best work of one of Ireland’s finest food writers. I edited it because I truly believe that every household should rediscover her. Theodora had an encyclopedic knowledge of food, and this book is chock-full of the sort of retro dishes that are enjoying a resurgence on menus the world over. This is full of quick, inspirational recipe ideas for hungry families that are time-starved. Expect traditional dishes served up with a time-saving twist. Part cookbook, part lifestyle guide, Surf Cafe Living is about the building of Jane and Myles Lamberth’s home in Sligo (see page 20 for more) and the dishes they create when they are entertaining their friends. This evocative book really captures their vibe and is full of inspirational ideas for entertaining at any time of the year. Jordan is an Irish food writer based in London, and a talented food stylist, too. This book advocates the use of healthier alternatives to refined foods without being preachy or puritanical. A small but perfectly formed read. This book, a new release, was just waiting to come along. A go-to guide for anyone interested in the burgeoning Irish craft beer industry. One of the many Nigel Slater books that line my shelves. I love the way he thinks about food and I admire the way his recipes carry instant authority.